I recently had a delicious dinner at Jack Allen's kitchen. Now, I know it's down in the great unknown territory of south-west Austin (be careful, there be dragons there), but if you haven't made it down there yet, you really should. I've eaten there as a regular, run-of-the-mill diner several times now, but those reviews are for another day. This post is about the wonderful wine dinner dinner they invited me to. And I will disclose that I was invited to this fine dinner and hence didn't pay for it (thanks FTC and your new fabulous rules). First of all, Jack Allen's Kitchen is way way out in southwest Austin. Basically, you go to the Y at Oakhill, take the 71 branch and go a mile. My parents live in that neck of the woods, so its not too far out of the way for me. I can imagine, though, how it might be on the other side of the planet for someone from Pflugerville, but it's well worth the trip. 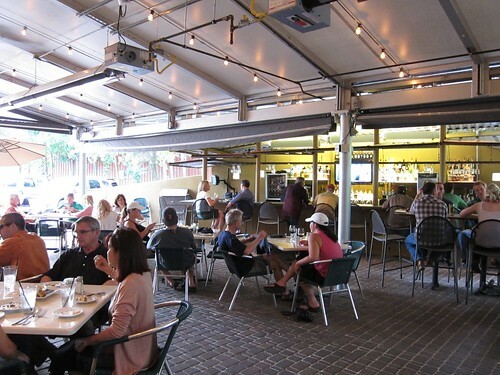 Jack Allen's is the brain child of ex Z-Tejas chef Jack Allen (surprise surprise). He took over the old space where the Y Bar and Grill (then Nunzia's) used to be, and you long time readers will remember how Nunzia's felt about us. So I'm really glad to see something reputable and delicious in it's place. Like so many of the new mid-dollar restaurants popping up over Austin now, Jack Allen's really focuses on using local ingredients. Their menu is a laundry list of local farms and food producers that brought a little tear to this foodie's eye when she first read. The food is mostly southern and southwestern inspired. It's kind of like everything Z Tejas wishes it normally were but can't be because it's a chain now (and I'll caveat that by saying Z Tejas wine dinners and special menus are delicious, it's just their normal menu that suffers a little). 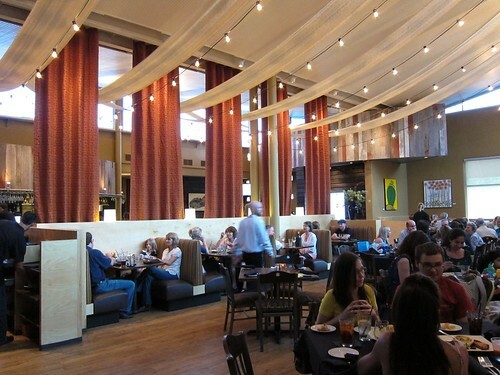 But enough about other restaurants, it's Jack Allen's you really want to know about. The wine dinner they invited me to a few (cough) months ago was really delicious and interesting. First of all it was multi course, which I am always a sucker for and second, they didn't offer just one wine pairing with each course, they offered two. Now before you accuse me of being a lush, let me describe how awesome this wine pairing was. The wine portion of the dinner was hosted by local Texas wine producers. For each course, there was one varietal and two wines, one Texas wine, and one other wine that is thought to be a good representation of the varietal. But did you know which was which? No! It was a blind tasting. You would get two small pours of each wine and you had to figure out which was the Texas wine. Sounds like a pretty awesome party doesn't it? It was. Our welcome wine was a Vermentino. A Vermentino is not a wine you come across a lot, but it's a lovely Italian white wine. It's bright and acidic and is usually made in Corsica. The two Vermentino's they brought were Mandola's and then Gagliardo Favorita. Now, I love Texas wines. I am a huge advocate of them. I know a lot of people poo poo them, but I think Texas wines are really unique and interesting. Most of them have such strong and powerful characters, just like everything else in Texas. But sometimes when you compare it to an old world wine, like a Vermentino, with a Texas wine of the same style, the Texas wine just doesn't hold up. So I was really surprised that I enjoyed the Mandola's Vermentino so much. It's bright acidity and mineral notes really made it stand out over the soapy Sardinian wine. 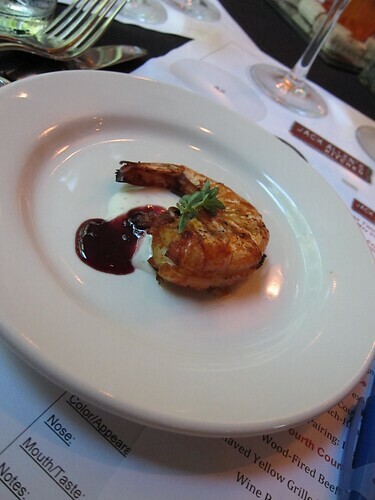 The first course was a Cold smoked and grilled jump shrimp with blackberry and lemon thyme aioli. This shrimp was delicious. It all of the rest of the meal had been horrible (which it wasn't), it would have been worth going to for this shrimp alone. What surprised me the most was how well the thyme, shrimp, and blackberry were together. It's a really different but spectacular combination. The wine pairing they chose for the shrimp was a Chenin Blanc. They compared a Beringer Chenin Blanc to the local Fall Creek version. Ok, I have to admit, I usually turn my nose up grocery store table wines. But the Beringer Chenin Blanc totally blew me away. It was sweet without being cloying and had nice fruit tones. It paired very well with the shrimp. I gotta tell you folks, for $6.99, thats a great bottle of wine for a light summer dinner (of shrimp of course). The second course, however, wasn't as strong as the first course of shrimp. It was a Seared Texas Redfish with Texas Citrus Mojo and Wilted Arugula. It just didn't work very well. The taste was rather bland and the textures ended up being homogeneous. The wine offerings for this course is one of my favorite types of white wine, a Viognier. For having such a fancy, French name, I would argue that most of the great bottles of Viognier out there today are American. California has a few good Viogniers, but the real US Viognier winner are the wineries in Washington. Trust me. The Viogners they chose for this tasting, though, were the Zaca Mesa from Santa Barbara and the local Becker. Zaca Mesa: A wine from Santa Barbara with flavors of apricot, violet and lavender. High in alcohol content. Becker: A local Texas wine that's grassy, with a lilac overtone and tastes of green pepper and dill. In this case, the Texas wine was the winner. The lilac and dill tones of the wine made for a deliciously complex flavor. Plus, I didn't care for this fish course as much, BUT it did pair nicely with the Becker Viognier. 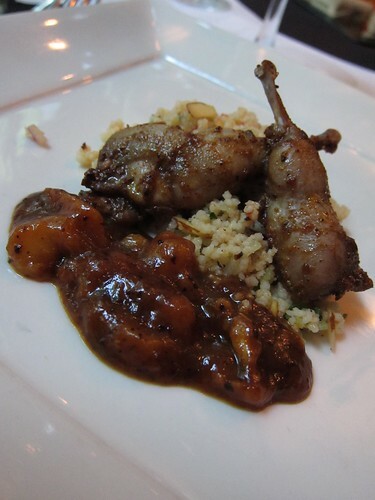 The third course was a Moroccan spiced Texas quail with toasted almond couscous and caramelized peach-honey glaze. The quail was cumin heavy, the couscous was hot and spicy and the glaze was sickly sweet. Individually, each one was too heavily spiced or flavored, but together the heavy spices combined well together. The was the favorite course of my dinner guest and boyfriend. He would NOT stop talking about how awesome this dish was. I thought it was pretty good, but I thought I'd comment that he thought it was amazing. They paired this spicy, and flavorful course with two wonderful roses, a great selection for this kind of food. This course paired nicely with the Texas rose, the ever present Texas winery, McPherson. It was sweet, with a pop of cherry summer berries and watermelon. The non-Texas comparative Rose, was just not worth mentioning. 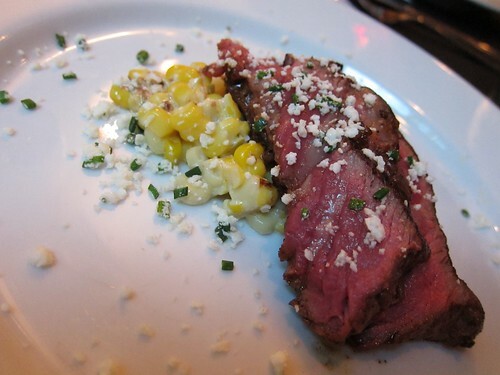 The fourth course was a Pecan wood-fired beef tenderloin with shaved yellow grilled corn and cotija. The beef had a salty, smoky crust and a tender texture. The shaved corn with cotija had a casserole-like texture. I felt like I was eating elote casserole and it was delicious! This was a spectacular dish. I've come to find out, they sometimes serve the awesome corn as their veggie side. Make sure you ask for it if you ever go. They paired this beef course with two Sangioveses. Both were lovely, and to be honest, I couldn't decide which one I liked better. But since I was (cough) getting a little drunk off all he wine, I didn't catch the name of the Chianti Classico vineyard, so we'll have to say the Flat Creek wins, simply because I remembered it. Chianti classico (vineyard unknown): Herby and astringent with heavy tannins. Tasted like a bouquet of flowers with pepper. After so much decadence, we had to be let down a little by the dessert course. It was a simple but delicious Chocolate truffle. Buttery, smooth, and melt in your mouth delicious. I guess I was looking for something I could really sink my teeth into, but hey, I'm never going to turn down chocolate! They paired the chocolate with two Bordeaux Blends. The one that stood out the most was the Inwood Estates Magellan. It was herb-y, leathery, smelled of tobacco and had strong, tongue sucking tannins. A very nice Texas wine.